Roald Amundsen, Helmer Hanssen, Sverre Hassel and Oscar Wisting (l–r) at "Polheim", the tent erected at the South Pole on 16 December 1911. The top flag is the Flag of Norway; the bottom is marked "Fram". Photograph by Olav Bjaaland. The first expedition to reach the geographic South Pole was led by the Norwegian explorer Roald Amundsen. 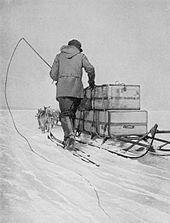 He and four others arrived at the pole on 14 December 1911,[n 1] five weeks ahead of a British party led by Robert Falcon Scott as part of the Terra Nova Expedition. Amundsen and his team returned safely to their base, and later heard that Scott and his four companions had died on their return journey. Amundsen made his Antarctic base, which he named "Framheim", in the Bay of Whales on the Great Ice Barrier. After months of preparation, depot-laying and a false start that ended in near-disaster, he and his party set out for the pole in October 1911. In the course of their journey they discovered the Axel Heiberg Glacier, which provided their route to the polar plateau and ultimately to the South Pole. The party's mastery of the use of skis and their expertise with sled dogs ensured rapid and relatively trouble-free travel. 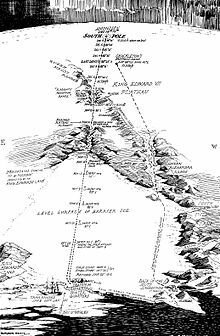 Other achievements of the expedition included the first exploration of King Edward VII Land and an extensive oceanographic cruise. 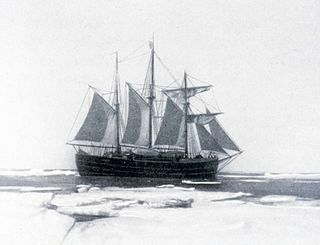 The expedition's success was widely applauded, though the story of Scott's heroic failure overshadowed its achievement in the United Kingdom. Amundsen's decision to keep his true plans secret until the last moment was criticised by some. Recent polar historians have more fully recognised the skill and courage of Amundsen's party; the permanent scientific base at the pole bears his name, together with that of Scott. Amundsen did not understand the apparent aversion of British explorers to dogs: "Can it be that the dog has not understood its master? Or is it the master who has not understood the dog?" he later wrote. Following his decision to go south he ordered 100 North Greenland sledge dogs—the best and strongest available. For the next three days the men worked to fix the exact position of the pole; after the conflicting and disputed claims of Cook and Peary in the north, Amundsen wanted to leave unmistakable markers for Scott. After taking several sextant readings at different times of day, Bjaaland, Wisting and Hassel skied out in different directions to "box" the pole; Amundsen reasoned that between them they would bracket the exact point. Finally the party pitched a tent, which they called Polheim, as near as possible to the actual pole as they could calculate by their observations. 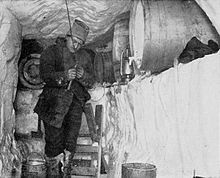 In the tent Amundsen left equipment for Scott, and a letter addressed to King Haakon which he requested Scott to deliver. In Hobart, Amundsen received congratulatory telegrams from, among others, former U.S. President Theodore Roosevelt and King George V of the United Kingdom. The king expressed particular pleasure that Amundsen's first port of call on his return had been on soil of the British Empire. In Norway, which only six years earlier had become an independent country after 500 years of Danish and Swedish supremacy, the news was proclaimed in banner headlines, and the national flag was flown throughout the country. All the expedition's participants received the Norwegian South Pole medal (Sydpolsmedaljen), established by King Haakon to commemorate the expedition. However, Amundsen's biographer Roland Huntford refers to "the chill underneath the cheers"; there remained a residue of unease over Amundsen's tactics. 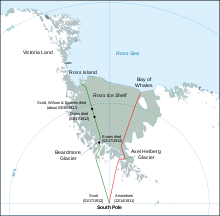 One Norwegian newspaper expressed relief that Amundsen had found a new route, and had not intruded on Scott's path from McMurdo Sound. According to Huntford, the news of Scott's death meant that "Amundsen the victor was eclipsed ... by Scott the martyr". In the United Kingdom a myth quickly developed in which Scott was portrayed as one who had behaved nobly and played the game fairly. He had been defeated because, by contrast, Amundsen was a mere glory-seeker who had concealed his true intentions, had used dogs rather than relying on honest man-hauling and had slaughtered these same dogs for food. Furthermore, he was considered a "professional" which, in the mindset of upper-class Britain of that time, diminished anything he might have accomplished. This narrative was heavily reinforced with the publication of Scott's journals and his "Message to the Public". Huntford points out that "[Scott's] literary talent was his trump. It was as if he had reached out from his buried tent and taken revenge." Even so, among explorers Amundsen's name continued to be respected. 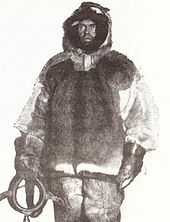 In his account of the Terra Nova expedition written a few years later, Scott's comrade Apsley Cherry-Garrard wrote that the primary reason for Amundsen's success was "the very remarkable qualities of the man", specifically his courage in choosing to discover a new route rather than follow the known path. In a paper published 100 years after the Amundsen expedition, researchers claimed that the tent and flags are buried under 17 m (56 ft) of ice and about a minute of latitude north of the South Pole, or about one nautical mile. Scott's party was the last to see the tent, which they found on 18 January 1912. Henry Robertson Bowers took a photo of the tent, but died returning from the Pole. ^ Some sources give the date as 15 December. Since the western and eastern hemispheres—and the International Date Line—are conjoined at the South Pole, both dates can be considered as correct, though Amundsen gives 14 December, both in his first telegraphed report on arrival in Hobart, and in his fuller account The South Pole. ^ Norway had separated from Sweden in 1905. 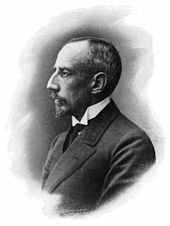 King Oscar of Sweden relinquished the Norwegian throne and Prince Carl of Denmark became King Haakon VII of Norway. ^ Peary quickly denounced Cook's claim as false, and subsequent investigations cast serious doubts on the latter's records. Peary's data, though challenged by Cook, were accepted without question by the National Geographic Society (which had sponsored his expedition). Public support for Cook quickly faded, although he retained some support, including that of Amundsen. 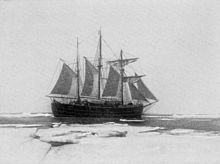 Peary was generally accepted as the conqueror of the North Pole until late 20th century research, particularly that of the explorer Wally Herbert, indicated that Peary did not in fact reach the North Pole. 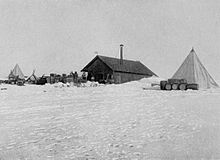 ^ Amundsen's theory about grounded ice was eventually proved wrong, although the ice in the vicinity of his camp did not break away significantly until 1987 and 2000. ^ The exact wording of this telegram has been differently reported. 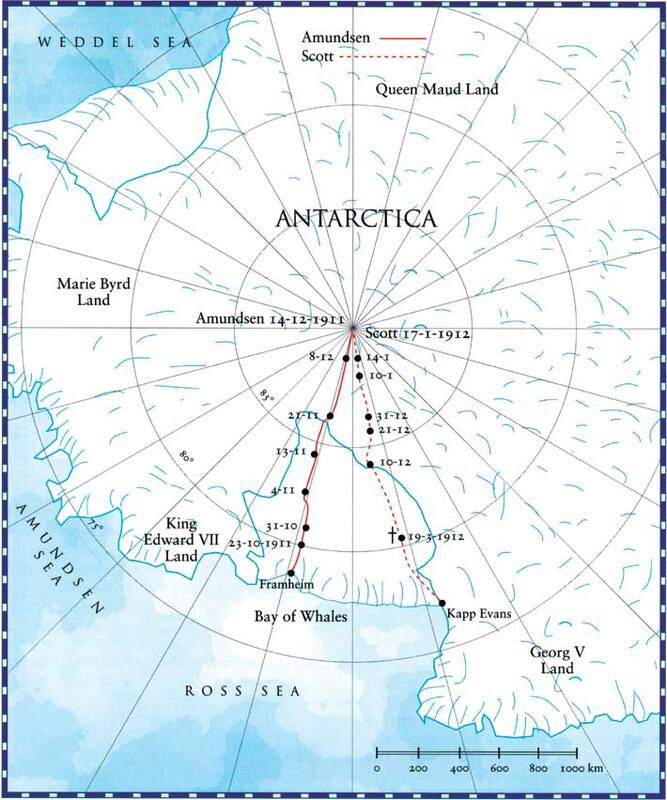 Crane and Preston, p. 127, record the wording as "Am going south"; Jones, p. 78, and Huntford (The Last Place on Earth) 1985, p. 299, give a longer text: "Beg leave to inform you Fram proceeding Antarctica". ^ Amundsen had divided the expedition into sea and shore parties. 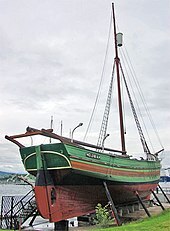 The sea party, under Nilsen, sailed with Fram; the nine-man shore party consisted of Amundsen, Prestrud, Johansen, Helmer Hanssen, Hassel, Bjaaland, Stubberud, Wisting and Lindstrøm. In The South Pole, Vol. I, p. 179, Amundsen omits Wisting from the shore party. ^ Other features encountered in this area and roughly mapped for the first time were named by Amundsen and his companions, mostly after themselves and those that had backed the expedition. These features included: the Queen Maud Mountains, the Prince Olav Mountains, Mount Fridtjof Nansen, Mount Don Pedro Christophersen, Mount Wilhelm Christophersen, Mount Hanssen, Mount Wisting, Mount Hassel, Mount Bjaaland, Mount Engelstad, the Liv Glacier, and the Nilsen Plateau. ^ Huntford (The Last Place on Earth) 1985, p. 511. ^ Amundsen, p. xvii, Vol. I. ^ Huntford (The Last Place on Earth) 1985, pp. 43–57. ^ a b Crane, pp. 74–75. ^ Huntford (The Last Place on Earth) 1985, pp. 64–74. ^ a b Langner, pp. 78–80. ^ a b Barczewski, pp. 60–62. ^ See Scott, J.M., pp. 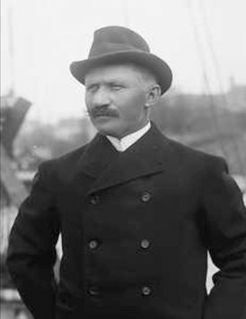 140–94 for a summary account of Nansen's Fram expedition. ^ Huntford (The Last Place on Earth) 1985, p. 194. ^ a b c Huntford 2001, pp. 547–49. ^ Huntford 2001, pp. 183–86. ^ a b Nansen, pp. 62–68, Vol. I. ^ a b The Fram Museum. ^ Scott, J.M., pp. 244–45. ^ Huntford (The Last Place on Earth) 1985, pp. 197–200. ^ Scott, J.M., pp. 200–02. ^ Huntford (The Last Place on Earth) 1985, p. 205. ^ Huntford (The Last Place on Earth) 1985, pp. 204–06. ^ Amundsen, pp. 36–41, Vol. I. ^ a b Huntford (The Last Place on Earth) 1985, pp. 205–07. ^ Amundsen, p. 72, Vol. I. ^ a b c Huntford (The Last Place on Earth) 1985, pp. 247–51. ^ Amundsen, p. 102, Vol. I. ^ Amundsen, pp. 137–38, Vol. I. ^ Weinstock, J. "Sondre Norheim: Folk Hero to Immigrant". ^ Huntford (The Last Place on Earth) 1985, pp. 90 and 248. ^ Huntford (The Last Place on Earth) 1985, pp. 276–77. ^ Huntford 2001, pp. 518–19, 542. ^ Huntford (The Last Place on Earth) 1985, p. 286. ^ The New York Times, 8 September 1909. ^ Amundsen, pp. 42–43, Vol. I. ^ a b Crane, pp. 425–26. ^ Huntford (The Last Place on Earth) 1985, p. 214. ^ a b c d Amundsen, pp. 45–7, Vol. I. ^ Amundsen, pp. 62–64, Vol. I. ^ Amundsen, p. 58, Vol. I. ^ Huntford (The Last Place on Earth) 1985, p. 210. ^ Amundsen, pp. 78–79, Vol. I. ^ Amundsen, p. 76, Vol. I. ^ Amundsen, p. 77, Vol. I. ^ Amundsen, pp. 85–86, Vol. I. ^ Amundsen, p. 51, Vol. I. ^ Amundsen, p. 55, Vol. I. ^ Amundsen, pp. 68–70, Vol. I. ^ Huntford (The Last Place on Earth) 1985, pp. 244–45. ^ Huntford (The Last Place on Earth) 1985, p. 275. ^ Huntford (The Last Place on Earth) 1985, pp. 277–78. ^ a b Amundsen, pp. 125–31, Vol. I. ^ From text of Amundsen's letter, quoted in Huntford (The Last Place on Earth) 1985, pp. 279–80. ^ Huntford (The Last Place on Earth) 1985, pp. 300–01. ^ Amundsen, pp. 138–68, Vol. I. ^ Huntford 1979, pp. 335–38. ^ Amundsen, pp. 181–82, Vol. I. ^ Amundsen, p. 194, Vol. I. ^ Huntford 1979, p. 368. ^ Huntford 1979, pp. 344–45. ^ Huntford 1979, p. 346. ^ Amundsen, p. 179, Vol. I. ^ Huntford 1979, p. 347. ^ Huntford 1979, p. 350. ^ a b Huntford 1979, p. 352. ^ a b MacPhee, p. 106. ^ Amundsen, p. 254, Vol. I. ^ Huntford 1979, pp. 357–58. ^ Huntford 1979, pp. 355–56. ^ Huntford 1979, p. 379. ^ Huntford 1979, pp. 382–83. ^ Huntford 1979, p. 390. ^ a b c Langner, p. 170. ^ a b Huntford 1979, p. 407. ^ Huntford 1979, p. 408. ^ Huntford 1979, p. 409. ^ Huntford 2001, p. 571. ^ Huntford (The Last Place on Earth) 1985, p. 386. ^ a b Langner, p. 178. ^ Huntford 1979, pp. 430–37. ^ a b MacPhee, p. 143. ^ Huntford 1979, p. 450. ^ Amundsen, pp. 63–66, Vol. II. ^ Amundsen, pp. 67–73, Vol. II. ^ Amundsen, pp. 105–07, Vol. II. ^ Huntford 1979, p. 459. ^ Huntford (The Last Place on Earth) 1985, pp. 451–52. ^ Huntford 1979, p. 487. ^ Amundsen, p. 122, Vol. II. ^ Huntford 1979, p. 491. ^ a b MacPhee, p. 155. ^ Huntford 1979, pp. 494–95. ^ Amundsen, p. 157, Vol. II. ^ Amundsen, pp. 173–74, Vol. II. ^ Huntford (The Last Place on Earth) 1985, pp. 493–97. ^ Huntford (The Last Place on Earth) 1985, pp. 510–11. ^ Amundsen, p. 352, Vol. II. ^ Amundsen, p. 216, Vol. II. ^ Amundsen, pp. 240 and 246, Vol. II. ^ Amundsen, pp. 249–61, Vol. II. ^ Huntford (The Last Place on Earth) 1985, pp. 493. ^ Amundsen, p. 316, Vol. II. ^ Amundsen, pp. 328–31, Vol. II. ^ Amundsen, pp. 316–28, Vol. II. ^ Amundsen, pp. 331–46, Vol. II. ^ Amundsen, pp. 271–72, Vol. II. ^ Huntford 1979, p. 527. ^ Sydpolsmedaljen (Norway's South Polar medal). ^ a b Huntford (The Last Place on Earth) 1985, pp. 511–16. ^ The Times, 9 March 1912, p. 5. ^ a b Huntford (Shackleton) 1985, p. 344. ^ Huntford (The Last Place on Earth) 1985, p. 525. ^ a b Huntford (The Last Place on Earth) 1985, pp. 525–26. ^ a b c Barczewski, pp. 1–2. ^ Huntford (The Last Place on Earth) 1985, pp. 532–33. ^ Huntford 1979, p. 496. ^ Huntford 1979, p. 529. ^ The Daily Telegraph, 19 December 2004. ^ Gray, Richard (31 December 2012). "Scott of the Antarctic could have been saved if his orders had been followed, say scientists". The Telegraph. Retrieved 27 March 2013. ^ National Science Foundation, 27 April 2009. ^ Orheim, Olav (21 January 2011). "The present location of the tent that Roald Amundsen left behind at the South Pole in December 1911". Polar Record. 47 (3): 268–270. doi:10.1017/S0032247410000719. ^ "In Search of Amundsen's Tent". 3 June 2012. Amundsen, Roald; Nilsen, Thorvald; Prestrud, Kristian (1976) . The South Pole: An Account of the Norwegian expedition in the Fram, 1910–12 (Volumes I and II). Translated by Chater, A.G. London: C. Hurst & Company. ISBN 0-903983-47-8. First published in 1912 by John Murray, London. Langner, Rainer-K. (2007). Scott and Amundsen: Duel in the Ice. Translated by Beech, Timothy. London: Haus Publishing. ISBN 978-1-905791-08-8. 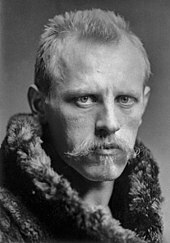 Nansen, Fridtjof (1897). Farthest North, Volume I. London: Archibald Constable & Co. OCLC 499726131. "Amundsen Would Compare" (PDF). The New York Times. 8 September 1909. Retrieved 15 October 2011. "Amundsen-Scott South Pole Station". Office of Polar Programs. National Science Foundation. 27 April 2009. Retrieved 16 October 2011. 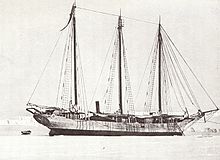 "The Polar Ship Fram". The Fram Museum. Archived from the original on 10 October 2011. Retrieved 16 October 2011. Weinstock, John. "Sondre Norheim: Folk Hero to Immigrant". The Norwegian-American Historical Association. Retrieved 16 October 2011.